At 13 he enrolled in the Lakeside School, an exclusive preparatory school. When he was in the eighth grade, the Mothers Club at the school used proceeds from Lakeside School's rummage sale to buy an ASR-33 teletype terminal and a block of computer time on a General Electric (GE) computer for the school's students. Gates took an interest in programming the GE system in BASIC and was excused from math classes to pursue his interest. He wrote his first computer program on this machine: an implementation of tic-tac-toe that allowed users to play games against the computer. Gates was fascinated by the machine and how it would always execute software code perfectly. When he reflected back on that moment, he commented on it and said, "There was just something neat about the machine." After the Mothers Club donation was exhausted, he and other students sought time on systems including DEC PDP minicomputers. One of these systems was a PDP-10 belonging to Computer Center Corporation (CCC), which banned four Lakeside students—Gates, Paul Allen, Ric Weiland, and Kent Evans—for the summer after it caught them exploiting bugs in the operating system to obtain free computer time. At the end of the ban, the four students offered to find bugs in CCC's software in exchange for computer time. Rather than use the system via teletype, Gates went to CCC's offices and studied source code for various programs that ran on the system, including programs in FORTRAN, LISP, and machine language. The arrangement with CCC continued until 1970, when the company went out of business. The following year, Information Sciences Inc. hired the four Lakeside students to write a payroll program in COBOL, providing them computer time and royalties. 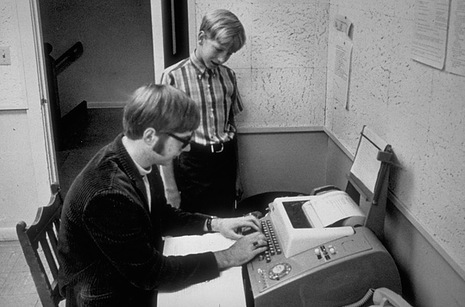 After his administrators became aware of his programming abilities, Gates wrote the school's computer program to schedule students in classes. He modified the code so that he was placed in classes with mostly female students. He later stated that "it was hard to tear myself away from a machine at which I could so unambiguously demonstrate success." At age 17, Gates formed a venture with Allen, called Traf-O-Data, to make traffic counters based on the Intel 8008 processor. In early 1973, Bill Gates served as a congressional page in the U.S. House of Representatives. Gates graduated from Lakeside School in 1973. He scored 1590 out of 1600 on the SAT and subsequently enrolled at Harvard College in the fall of 1973. It was during the spring term of 1968, at Lakeside Prep School that Bill Gates first used a computer. Though computers were still too expensive to buy, the school held a fundraiser and acquired computer time on a DEC PDP-10 owned by General Electric. This cost them several thousand dollars but the school expected this to last them a whole year. However the schools did not count on the enthusiasm of several young students. 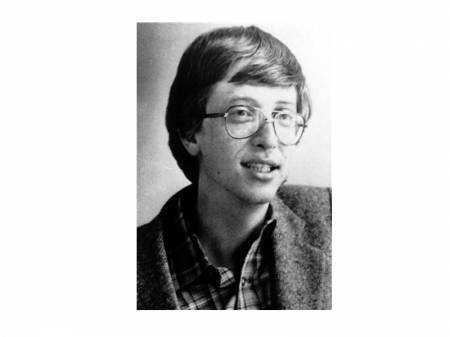 He, Paul Allen and several other students (of which many became Microsoft programmers) became addicted to the computer, spending all day and all night writing programs and reading all the material they could get their hands on. Soon this began to take its toll on their education. Homework was being handed in late, classes were being skipped and all the schools computer time was used up in a few weeks. In autumn 1968, the Computer Centre Corporation opened in Seattle, offering computer time at good rates. A deal was soon struck between Lakeside Prep School and the Computer Centre Corporation that allowed the school to continue to provide computer time for their students.He and his friends wasted no time in exploring the new machine and soon started causing problems. They caused the system to crash several times and broke the security system. They even got banned for several weeks after changing into the file that recorded how much computer time they were using and altered it. In late 1968 the Lakeside programming group was formed consisting of him, Paul and two other students from Lakeside Prep School. They wanted to apply their new computer skills to the real world. They got this chance when the Computer Centre Corporation struck a deal with them. In exchange for unlimited computer time, He and his friends searched the computer for bugs and weaknesses in the system. "It was when we got free time at C-Cubed (Computer Centre Corporation) that we really got into computers. I mean, they I became addict. It was day and night,". The Computer Centre Corporation went out of business in March 1970. The Lakeside programmers now need a new source of computer time. Their next chance came from Information Sciences Inc. who hired them to create a payroll program. In exchange for this they would be given free computer time and royalties from the software, giving in them a source of income for the first time. Traf-O-Data was his and Allen's next project creating software to help measure traffic flow. They earned Wealth of approximately $20,000 from the company in total, which latest untill he left for college. The Lakeside School is a private school in Seattle, Washington, USA, for grades 5–12. Lakeside regularly sends approximately 25% of its graduating class to Ivy League schools, and 99% to college. Its most famous alumni are Bill Gates and Paul Allen, founders of Microsoft, who got their start programming tic-tac-toe on a time-shared computer provided by the Lakeside Mothers' Association and the Lakeside Mathematics Department. Other famous alumni include the McCaw brothers, who built a family business into the McCaw Cellular telephone empire which they eventually sold to AT&T Wireless; actor Adam West; bestselling author Po Bronson; and former Washington State Governor Booth Gardner.